Established in 1991, Abbotts Memorials has been crafting stunning stone monuments for over 20 years. We take great pride in continuing the tradition of crafting and supplying beautiful stone monuments and memorials. Specialising in memorials, headstones and inscriptions, our team of experienced craftsmen have been producing some of the finest masonry for over two decades. As a result we have earned a reputation for quality and service throughout Leeds, Yorkshire and the surrounding areas. At Abbotts Memorials, we understand that each memorial should be unique to reflect the individuality of the person they commemorate. With our extensive range of materials, we are able to provide a diverse selection of stones and a tailored service to suit any requirements you may have. Our team of expert craftsmen also specialise in maintenance and renovation and are experienced in restoring memorials back to their original condition, so the memory of your loved one will be commemorated by a stone guaranteed to remain looking beautiful for years to come. The committed craftsmen at Abbotts Memorials will work closely with you, combining modern and traditional techniques and the finest, carefully selected materials to ensure each and every piece is special. There are many aspects you should look for when choosing the right stonemason. Expertise, reliability and an excellent reputation are but a few – Abbotts Memorials can offer you all of these and more. 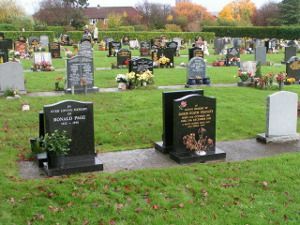 You can rely on our dedicated team of skilled stonemasons to deliver exquisite service through all stages of commissioning your unique memorial. Contact us today on 01423 864263 to discuss our headstone and memorial stone masonry services in Knaresborough.